Google has announced the launch of Google Ad Planner. 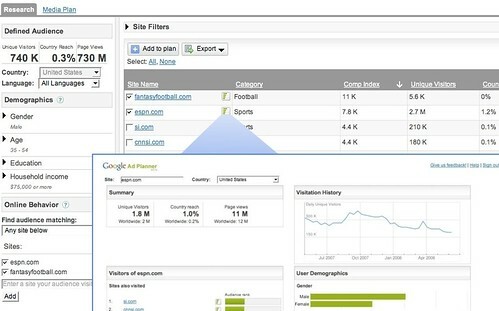 Ad Planner is Google Trends for Web Sites on steroids. Basically, it gives you site data for publisher sites you might want to place your ads on. You "enter demographics and sites associated with your target audience, and the tool will return information about sites that your audience is likely to visit." This works both on Google's content network and off the content network. Here is a screen capture of a report from the system, a full size is available over here. How do you gain access to this tool? You need to be invited, and you can request an invite over here. The single biggest issue that the new website trends should drive home, is that we should all now have a good understanding and insight into the bulk of data that Google knows about our websites. There are so many people that are naive about this issue. Google knows so much more than is generally acknowledged. This plays on many areas, including AdWords and organic results. Update: I have just gained access to Ad Planner and posted detailed screen captures of the tool. I am in awe. Previous story: Does Google Needs an Ombudsman or Not?